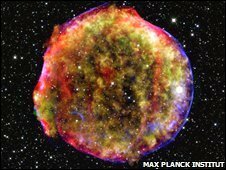 Now the supernova recorded by Tycho Brahe has been glimpsed again, by Max Planck Institute scientists. They used telescopes in Hawaii and Spain to capture faint light echoes of the original explosion, reflected by interstellar dust. This "fossil imprint" of Tycho's famous supernova is reported in Nature. The study will help solve a 400-year-old mystery over the nature of the celestial event which captivated observers across the globe. In early November 1572, the brilliant "new star" appeared in the constellation Cassiopeia, and was even visible during daylight. 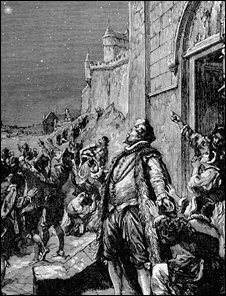 Among those who marvelled was the great Danish astronomer Tycho Brahe, who recorded its precise position in his book, "Stella Nova". His measurements revealed the "new star" was located far beyond the Moon - contradicting the Aristotelian tradition that such stars were unchangeable - which had dominated western thinking for nearly 2000 years. 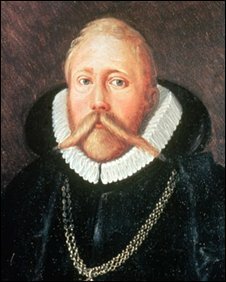 Tycho Brahe was captivated by the mysterious "new star"
This set the stage for the work of Kepler, Galileo, Newton and others. "The supernova of 1572 marked a milestone in the history of science," said Oliver Krause, of the Max Planck Institute for Astronomy, Germany. "It ultimately led to the abandonment of the notion of the immutability of the heavens. "But its classification has been controversial. "The determination of the exact supernova type has not been possible, without spectroscopic information." 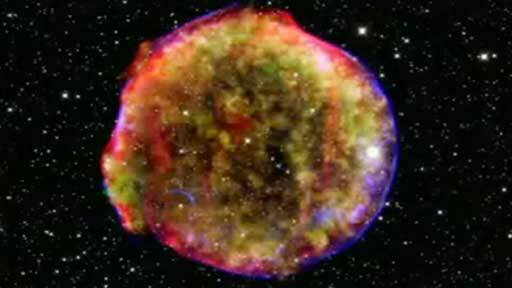 Based on historic records, Tycho's supernova [SN 1572] has traditionally been interpreted as a type Ia supernova. Such supernovas are believed to occur when a white dwarf star undergoes a titanic, thermonuclear explosion. Material from the star is ejected at up to 18,000 miles per second - or one-tenth of the speed of light. The debris from Tycho's supernova has expanded over the last 400 years into a cloud of gas and dust with a diameter of more than 20 light years. But the nature of the original explosive event which created this remnant has remained unresolved. To elucidate, Dr Krause and his team conducted a "post-mortem", by training their telescopes on faint light echoes from the original event. A supernova explosion acts like a cosmic flashbulb - producing light that propagates in all directions. The first direct light wave from the explosion swept past Earth in 1572, observed by Brahe. But even today, further waves of light from the original explosion continue to reach Earth indirectly - reflected in the "mirror" of interstellar dust particles. These "light echoes" contain a kind of "fossil imprint" of the original supernova, and are used by astronomers to "time travel" back to witness ancient cosmic events. Dr Krause and his team were able to detect an optical spectrum of Tycho's supernova at near maximum brightness, using telescopes at the Calar Alto observatory, Spain, and at Mauna Kea, Hawaii. "We find that it belongs to the majority class of normal type Ia supernovae," said Dr Krause. "An exciting opportunity now would be to use other [light echoes] to construct a three-dimensional spectroscopic view of the explosion." The new measurements may also shed light on important, unsolved questions about how type Ia supernovae arise. In one model, a white dwarf star accumulates (accretes) material from a companion star until it reaches a critical mass and undergoes a thermonuclear explosion. 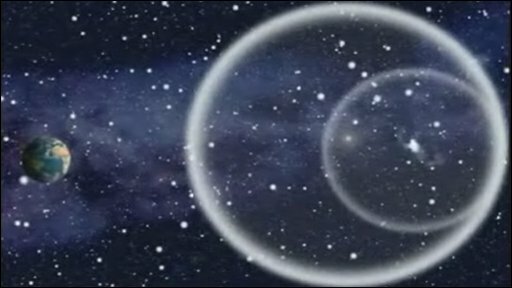 In another, the accretion occurs by the merging of two white dwarfs. The proximity of Tycho - which lies in the Milky Way - makes it an ideal candidate for more detailed studies. "The technique of observing light echoes from supernovae is a remarkable observational tool," said Dr Andrea Pastorello, of Queens University, Belfast. "It will allow astrophysicists to characterise other supernova remnants in our galaxy and in nearby galaxies. "This will hopefully clarify the relationship between supernova relics and their explosion mechanisms. "Finally, it is likely that precise information about the frequency of the different supernova types in our galaxy and its surroundings will shed light on the star-formation history and chemical evolution of the local group of galaxies."